Waheguru Ji Ka Khalsa Waheguru Ji Ki Fateh. Hukamnama today is in Goojree Raag by Sri Guru Arjan Dev Ji Maharaj on Ang 499 of Sri Guru Granth Sahib Ji. Satguru Arjan Dev Ji Maharaj in today's Shabad is telling us, O human being all other life supports in your life will fall away. The only support, the onlyaasraa, the only support that will remain forever is that of God, of Akaal Purakh, Waheguru Ji. Satgur JiBegins the Shabad in Goojri Raag , Mehlaa 5.
maat means mother; pitaa means father; bhaa-ee means brothers; sut means sons; banDhap means all other relatives. tin kaa bal hai thoraa Guru Ji says they all have bal sort of power, but it is thoraa - means a small amount. Our mother, our father, our brothers and sisters, our siblings, our children, our friends, our relatives, they may have some sort of power in their hands. Someone may have power of village on their hands, someone may have power of town on their hands, someone may have of the city, someone may have power of this world, but ultimately their power is finite. Ultimately the day comes and it is your funeral, the power is burning. Their power ends. In this world we say that, in Punjab there is a saying: a doctor which is a God, but there comes a time when the doctor puts up her or his hands in the air and says I cannot do anything. This is the end. There is nothing humanly possible beyond this point. par piaario, there is a support from this point which goes beyond all human points, all physical points. There is support in or lives which we can grab on, help us even beyond the flames of our funeral pyre. Guru Ji saysmaat pitaa bhaa-ee sut banDhap tin kaa bal hai thoraa Recognize that your mother, father, daughters, sons, your brothers, your sisters, your friends, they have bal they have power, they have some sort of capacity but it is thoraa, there is a limit. The human being says, well, what about all of this world that I see around me? What about all of these beautiful joys and pleasures, what about them? OK my relatives may not be able to help me in those last moments. My mother and father may not be able to help me. My friends may not be able to help me, but what about this maa-i-aa around me, what about all these pleasures of the world. Guru Ji says, anik, anik means countless. There are countless rang - pleasures of this world, maa-i-aa kay of this world which is an illusion. Why is this an illusion? Because it does not remain forever, because it is not eternal. The transitory pleasures of this world which only remain for a few days, maa-i-aa kay paykhay Guru Ji says I have seen them. I have tasted them. But Guru Ji says kichh saath na chaalai bhoraa, bhoraa means a tiny amount, saath means to go with you, means to be with you, na chaalai means to not go. In the end all of what you got together none of that goes with you. In Sukhmani Sahib we read, Guru Ji says, jeh maat pita sut meet na bhaa-i teh ooha naam terai sang sahaa-ee O human being where your mother and father cannot help you, those who nourished you, raised you, who brought you up in this world, they cannot help you. Guru Ji says the name of God will be there to help you. And when we talk to Guru Gobind SIngh Ji Maharaj, Guru JI says Paun Bhandaar Dharaa garh jaytak Chhadat paraan bigaan gahe. All of that stuff Paun Bhandaar - all of the treasures that you have got together in your life, Chhadat paraan when you die bigaan gahe that same ten pound, ten dollars, ten rupees in your pocket suddenly goes into the pocket of someone else. They become bigaan, they become belonging to someone else. And amongst all of this because Gurmat always brings a positive light. Guru Ji says after seeing all of this, the transitory pleasures of the world, none will go with me. My mother, father, sisters, brothers and relatives, their power has a limit. Who have I come to, thaakur, O Master, Lord, Waheguru, O divine light, tujh bin aahi na moraa, tujh - you; bin means without,aahi na moraa there is no one else who I can look to. There is no one who is truly mine. aahi na moraa There is no one who I can call mine. How can you call them yours? They leave you. Guru Nanak Dev Ji Maharaj says sajjan say-ee naal mai chaldi-aan naal mai chalan That is a true friend who goes with me where ever I go, even through the fires of the funeral fire. God is that true friend, God is that friend, that divine light who will be with you beyond even physical death. Guru Ji says mohi anaath, anaath means with no master, literally I am a orphan. nirgun - I have no virtues, gun naahee mai - I have no merits at all. Guru Ji says it again: mai aahi-o tumHraa Dhoraa, aahi-o means to long for, to want, to desire. Guru Ji I am anaath, I amnirgun. Guru Ji is teaching us something here. We cannot come to the Guru and have any other Master. We cannot come to the Guru Ji and say, Guru Ji, I can be your Sikh for sometime but my mind body and soul belongs to someone else or something else for the rest of the time. And even when we look at other traditions, when we look at the Bible, in the gospel of Luke, it says that no one can serve two masters. Either ou hate one and love the other. Either you are devoted to one and despise the other. You cannot serve both God and the Mennen. Mennen means maa-i-aa, this world. You can either serve the Guru or you can serve these transitory pleasures of the world. You can keep serving your tongue whatever it desires. You can keep serving all the sensory pleasures, whatever they desire. Now Guru Ji says if you are going to come to the Guru and ask for his Dhoraa, Dhoraa means support, Waheguru Ji's support. You are going to say I amanaath , I have no other master. I have no one else to call my own. nirgun At this point Guru Ji stresses the point - nirgun means you have no virtues, not just to say it but believe it. Guru Ji stresses again and again, says it again and again nirgun gun nahee I am not just without merit Maharaj I don't have even one gun, one praise. Those are the two conditions we should have in our minds when we come to the Guru. To not be serving any other master and to believe inside us. Maharaj I have no virtues. praises or merits. To come in front of the Guru in complete humility and completely one mindedly, single mindedly and asking for Guru's protection. mai aahi-o tumHraa Dhoraa Rahaa-o Pause and think about this today. This is how you are supposed to come and beg for Guru's support. Maharaj, I am a sacrifice, I am a sacrifice, I am a sacrifice. Sampardayi MahaPurakh they translate this as I sacrifice myman, buDh, chit, ahankaar Sacrifice myman means all of those thoughts in your mind, good and bad thoughts. I sacrifice all of that to you. buDh means your discerning intellect, your conscience so to speak, which tells you from bad to wrong. Even that I have given up for you. Now you will say, well giving up your mind as well as thoughts, that is fair enough but wh give up our intellect, why give up your conscience. When Guru Nanak Dev Ji asked Bhai Lehnaa to eat the dead human being, the bodyy theyy had found in the jungle. Now that is against the conscience of many people but Bhai Lehnaa had given up his man, buDh, chit, ahankaar Bhai Lehnaa had given up hisbuDh, he said Guru Ji you are my buDh, youu are my chit, you are my focus. You are my conscience. Bhai Lehnaa Ji simply asked Guru Nanak Dev Ji, Maharaj which side should I start eating from, feet or head. When he picked up the chaddar, the sheet, Karha Parshad was there. There was sweet food there. Anyway, Sampardayi MahaPurakh say give up mind, man; all of those thoughts with mind. Second thing give up your conscience even to the Guru. Give your chit, give your focus to the Guru, your concentration to the Guru. ahankaar give up your sense of self, give up sense of I. charan tumHaaray and what should I cling to after I giving up all those things - charan tumHaaray - lotus feet of God. Take the lotus feet of God. And many times we have gone through the Hukamnama Katha, what are the lotus feet of God? Guru Gobind Singh Ji says in Jaap Sahib, chit charan Naam to have the name of God in your heart, that is hanging on to the Lotus feet of God. eehaa oohaa tumHaaraa joraa That person who gives his man, buDh, chit, ahankaar to the Guru, that person who hangs on to the lotus feet of the God, what does he have eehaa in this world;oohaa means in the next world tumHaaraa joraa he realizes, she realizes the only joraa, the only power is of God, is of Waheguru. In this Shabad Guru Ji is talking to Waheguru. 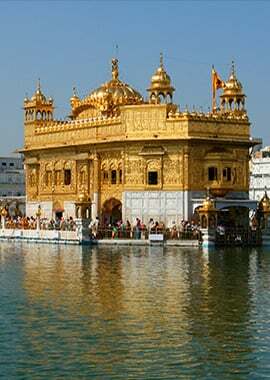 tumHaaraa joraa Just like sitting in front of Waheguru Ji, Waheguru, it is your power in this world, in next world. When I met with the saaDhsang, when I met with the Guru, the true saint, what happend - daras paa-i-o Guru Arjan Dev Ji Maharaj says that is the day I saw God, that is the day I experienced God, that is the day I felt God. And what happens? binsi-o sagal nihoraa, nihoraa means to beg for from others, look to others.sagal means all, binsi-o means to be eradicated, to be destroyed. All of my begging in front of others, all of my going in front of others and asking them has all died, the day I came to the Guru and the Guru revealed to me the life of God.